If Socchi left a bitter aftertaste, the Pyeongchang winter Olympics represents a wholly different games. 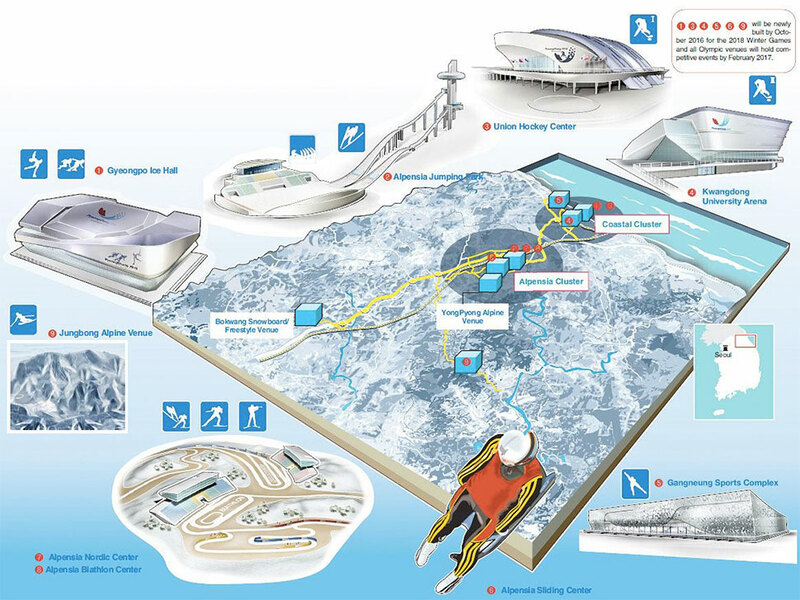 Pyeongchang beat Munich, Germany, and Annecy, France, to host the games, and it promises a lot. With the $2.4 billion budget, rivalry with the North (who will be competing) and the first Olympics on the Korean Peninsula this will surely be a successful event, at least from a news media perspective. The games run from the opening ceremony on the 9th February through to the close on the 25th, with fifteen sports on display. The sports are (with medal races in brackets): Alpine skiing (11), biathlon (11), bobsleigh (3), cross-country skiing (12), curling (3), figure skating (5), freestyle skiing (10), ice hockey (2), luge (4), Nordic combined (3), short track speed skating (8), skeleton (2), ski jumping (4), snowboarding (10), speed skating (14). Four new disciplines in existing sports will be introduced this year, namely big air snowboarding, mixed doubles curling, mass start speed skating, and mixed team alpine skiing. The Paralymics follow from 9th to 18th March, with six sports in competition. Korea is nine hours ahead of the UK, so a lot of the action will happen overnight or in the mornings, UK time. Eurosport and the BBC have got the rights to broadcast the games, so Ski Sunday should be well worth catching both on live TV and the red button, and hopefully there will be good coverage on the BBC’s Breakfast TV. Expect blanket coverage on Eurosport. From a UK perspective there are a few competitors to watch out for. This will be the largest British winter Olympics team ever, and expectations are high. In Slalom, Dave Rydling must fancy his chances, whilst in the female slalom both Alex Tilley and Charlie Guest should put in a respectable run or two. In the Freestyle Ski competitions Lloyd Wallace competes in the Aerials and Emily Sarsfield in Ski Cross. James Woods, Katie Summerhayes, James Machon, Rowan Cheshire and Izzy Atkins compete in the Park and Pipe, with Woodsy looking the best bet for a medal. In the snowboard Park and Pipe Katie Omerod is the best medal prospect, but also competing will be Jamie Nicholls, Billy Morgan and Aimee Fuller. In Cross-country the Scots Andrew Musgrave and Andrew Young will be representing Team GB. The speed skater Elise Christie and the reigning Olympic skeleton champion Lizzy Yarnold will be looking for medal positions. And, of course, there is the wonderful women’s curling team! The hugely successful US team also has its largest, and most diverse, contingent ever – indeed the largest from any nation ever with 135 men and 107 women. Alpine downhill stars Lindsey Vonn and Mikaela Shiffrin will be leading the medal charge. Teenage snowboarder Chloe Kim is one of team USA’s strongest medal contenders but will also attract attention as she is from a native Korean-speaking family. Canada and Norway are likely to be competing with the USA to achieve the biggest medal haul. Norway’s Aksel Lund Svindal and Henrik Kristoffersen will be amongst the favourites in the Blue Riband event, the men’s downhill. Traditionally Germany has done well across all disciplines and the Netherlands bags a few golds due to the nation’s strength in speed skating. The Swiss and Austrians, perennial rivals, will be competing to get more medals than each other. They normally get around five Golds each. The Swiss will be looking to Beat Feuz in the downhill to continue his good form this season, and Lara Gut is looking like she could recover some of her best form. Medals for Switzerland are also likely in freestyle, snowboarding, cross-country and curling. Marcel Hirscher will lead Austria’s downhill charge. Although clean Russian athletes will be allowed to compete as individuals, following the state-sponsored doping in Socchi, Russian government officials are banned from attending the Games, and neither the country’s flag nor its anthem will be allowed. At the more esoteric end of the scale, Nigeria will be competing in bobsleigh and Jamaica in ice hockey. The FIS World Championship in Vail and Beaver Creek is about halfway through, and it has been a fascinating competition, with wonderful conditions. 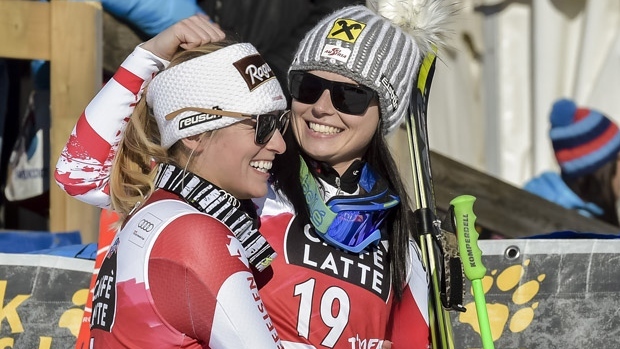 In the Ladies SuperG, Austrian Anna Fenninger held off Tina Maze and local favourite, Lindsay Vonn. Maze, however, came off top in the Downhill, edging out Fenninger and Switzerland’s Lara Gut, fresh from her win in St Moritz. Meanwhile the Mens competition has looked kindly on the Swiss, with a Gold for Patrick Keung and a Bronze for Beat Feuz, with America’s Travis Ganong sandwiched between them. The Super G saw Hannes Reichelt of Austria on the podium with Gold, followed by Canada’s Dustin Cook and France’s Adrien Theaux. Marcel Hersher rounded out a good few days for the Austrians, taking the Combined Gold, whilst the sensational winner at Kitzbühel, Kjetil Lansrud, came in second with Ted Ligerty third. The fractions of a second difference in medal positions are recorded by Longines, the Swiss watch maker based in St Imier since 1832. The company has a long association with skiing, stretching back to ski trials in Chamonix in 1933, and it has been official partner and timekeeper for the FIS since 2006. The relationship was re-inforced when Longines took on the same role for the 2015 FIS Alpine World Ski Championships in Vail and Beaver Creek, as they had for previous World Championships. To commemorate the occasion they have launched a new chronograph, the alluring Conquest 1-100th Alpine Skiing. One for my wish list for sure, and one I will be looking forward to checking out at Baselworld, the watch fair in Switzerland that takes place next month. In addition, the equally alluring and talented Mikaela Shiffrin has been announced as Longines Ambassador of Elegance. I had to go down to Switzerland for some business and thought I would take in a day’s skiing, even though the weather didn’t look good and I had a cold. The trip was painless and it made a nice break despite my heavy head. I took a bed on the excellent City Nightline on Thursday night from Utrecht to Basel for around fifty euros and was in Basel before 7am. If it wasn’t for the business, I could easily have been on the slopes somewhere like Wengen within a couple more hours. The next morning I got up early and took a train across to Zurich where I bought a Snow’n’Rail combined ticket at SFR 60. Despite all the talk of the cost of the Swiss Franc, somehow sixty francs for a scenic trip up the Linthal valley and a day in one of the most pleasant small, car-free resorts seems to me good value. Braunwald is not a huge resort, but it does have a good range of skiing as well as plenty for non-skiers to do – indeed, despite it being a Saturday, the slopes were almost empty and there seemed to be more tobogganists and winter walkers below the Eggstöcke than skiers and snowboarders. It has struck me before how unusual a resort so easy to get to from Zurich is so quiet at weekends, with most weekend warriors preferring to go to Hoch-Ybrig or Flumserberg. The trip really is a doddle, with the funicular railway right in the Linthalbahn Braunwald railway station. 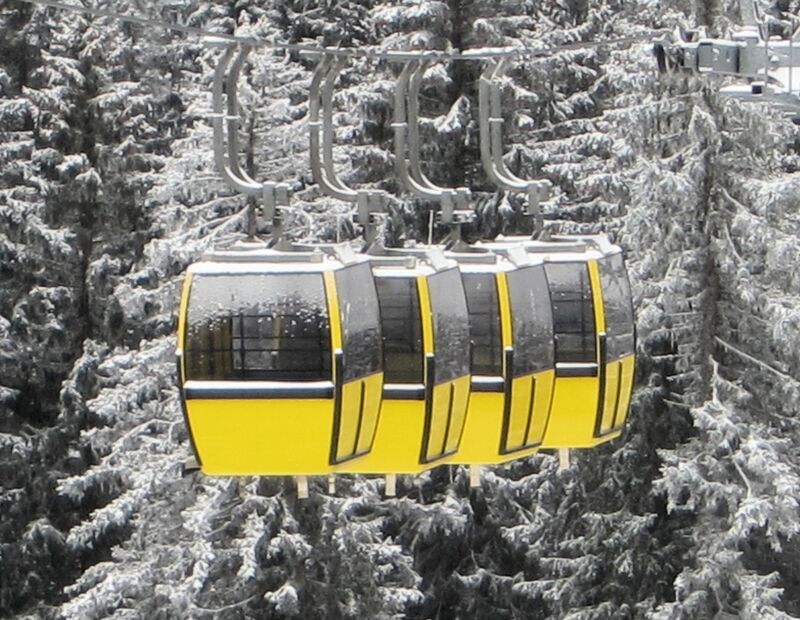 A quirky feature of Braunwald is the configuration of gondolas used in the resort, with one cableway operating them in pairs, another in quads and a final one alternating with chairlifts on the same cable. The weather wasn’t great so I had a leisurely day on the slopes. I later saw replays of Lara Gut winning in St Moritz, but the self-service restaurant at Grotzenbüel put up a big screen to let us watch the racing live at Kitzbühel on the shortened Streif course off the Hahnenkamm. 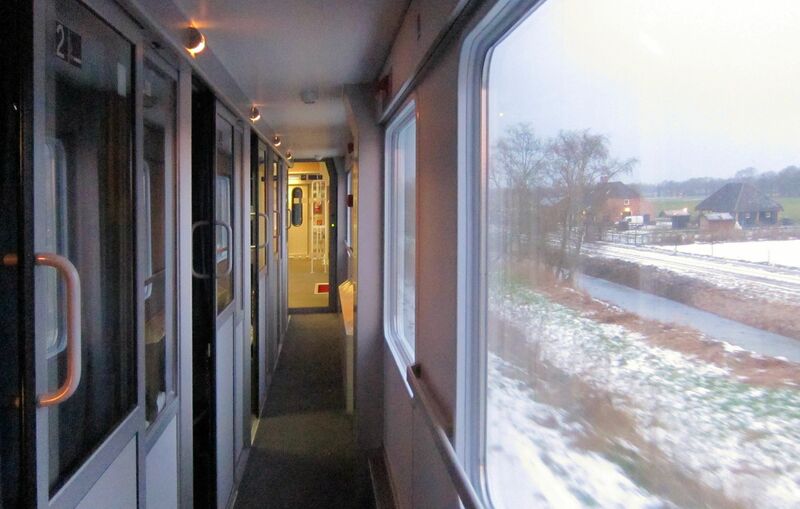 After a pleasant day on the slopes, a leisurely train journey back down the valley and a meal at Zurich Station’s NordSee fish restaurant it was time to get on the sleeper back to the Netherlands in the company of two charming Chinese ladies. The fare was cheaper than from Basel bizarrely, some 44 euros. The Snow’n’Rail scheme from Swiss Railways provides a 20% discount on the combined public transport and lift passes for a whole host of resorts in Switzerland. Additionally there are often even better offers available, and January sees some really brilliant ones. Airolo is a pretty little village, famous as the home resort of Lara Gut, with enough slopes to keep most skiers and snowboarders happy for a day trip. They will be particularly happy with the massive 50% discount offered in January. 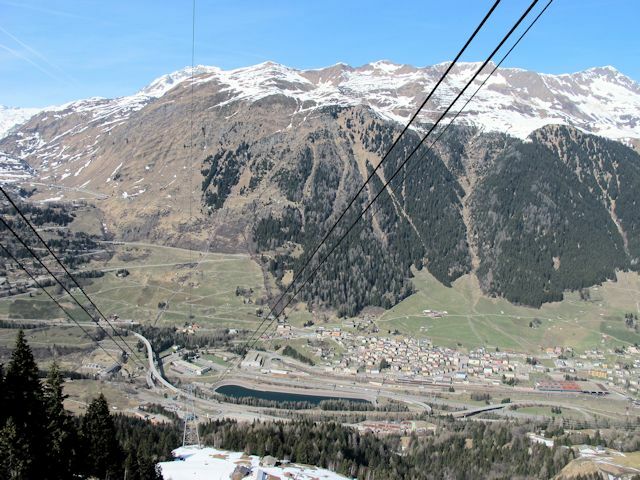 You can get to Airolo from many locations, including Basel and Zurich, without changing trains – and there are not many resorts you can say that of. Plus it is the largest Italian-speaking resort in Switzerland. If you do take the train to Airolo you can either take the courtesy bus from the station or walk to the bottom station – head left out of the station. 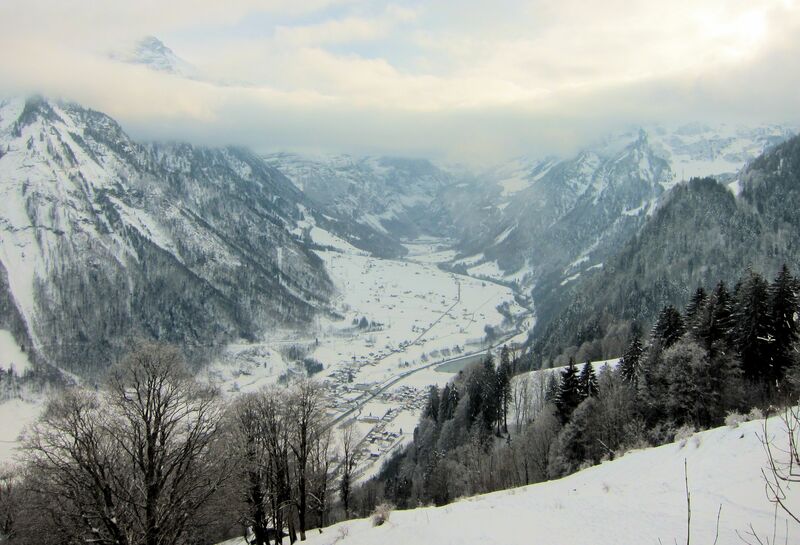 Other noteworthy deals are the 30% discount for Distentis (here), a favourite for freeriders, Meiringen-Hasliberg (here), convenient for Basel and Berne, Sattel (here), convenient for Zug and Lucerne, and Braunwald (here), a direct train trip from Zurich.